Why not get in the spirit of Thanksgiving with a set of Lunchbox Love cards specially made for Thanksgiving? With these cards you can help remind your loved one of everything they should be thankful for. The cards focus on having gratitude for what you have and are perfect reminders of what the season is about. On the back of each card is a fun fact that has to do with Thanksgiving. For example, do you know how many millions of turkeys are cooked and eaten in the US every Thanksgiving? Do you know when Thanksgiving was declared a national holiday? 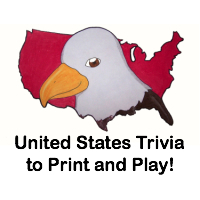 Do you know who thought the national bird should be a turkey (instead of a bald eagle)? Well, you'll just have to buy a set of Lunchbox Love for Thanksgiving cards to find out! Why not buy turkey or fruit place card holders along with your order of Lunchbox Love for Thanksgiving cards? Lunchbox Love for Thanksgiving cards can also be used in the place card holders, which will be adorable (and educational) additions to your Thanksgiving table. Go order yours today! Cost: One set (12 cards) of Lunchbox Love for Thanksgiving is $3.99 + shipping ($$$). Overall: We give Lunchbox Love for Thanksgiving a 10/10! 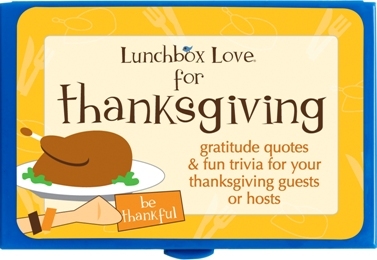 One lucky reader will win a set of Lunchbox Love for Thanksgiving cards! And if you don't win (or even if you do), you can use the promo code featured above for 10% off of an order, and you also get free shipping on orders of 4 or more volumes of Lunchbox Love. This giveaway will close on November 30, 2010 at midnight. We were sent one set of Lunchbox Love for Thanksgiving cards free of charge for the sole purpose of this review; no other compensation was received. All opinions expressed are my own. I signed up for Lunchbox Love Newsletter.